Audience Reception theory has been studied for many years, with the main question being – is the audience passive or active? ‘Passive’ audiences are explained to simply consume the media’s messages and ideas, essentially saying that the media is ‘injected’ into the audience like a hypodermic needle, or that it is like a “package that the sender (producers) throw to the receiver” (Alasuutari, 1999). More commonly audiences are seen as being ‘active’, in that audiences can receive messages from the media in different ways to which the producer intended them to be received. This could also mean that “different audiences may also decode a programme differently” (Alasuutari, 1999). Individuals personal taste, personality and opinions can effect how they understand and engage with media. One of the main theorists for audience reception theory is Stewart Hall, who explored this theory of Encoding and Decoding, explaining that a producer will encode a meaning into the media they produce, but an audience can decode the media in ways that they wish. Stewart Hall “proposes three potential decodings”, preferred, negotiated and oppositional (Louw, 2001). The preferred reading is the meaning the producers intend the audience will receive. The negotiated reading is when the audience understands some of the message/meaning the producers intended, and the oppositional reading is when the audience does not understand or completely disagrees with any of the messages the producers intended for the audience to read. All of this shows how different audiences can perceive ideas and messages in completely different ways, so even if the media text is targeted at a specific audience, there are factors in individuals which will effect how they perceive information, such as gender, age, class, location, hobbies and interests etc. For example Morley composed a Nationwide study in 1980 and “discovered that readers decode as individuals, not collectively as a ‘class’” (Louw, 2001). Therefore showing that even if a text was targeted at a very specific audience, they would decode it in their own way rather than it being similar because they are the same class for example. The reason I am researching audience theory is because I will have an intended reading for my design that I would want the audience to understand and see when engaging with it, but I am aware that people will read and understand things differently. This is why when I test my design in the public space, I will need to ask people questions about ‘what they feel’ when they engage with it, or what do they think it means. I know that the audiences will have to be active when interacting with my design as they will have to go out of their way to see it and engage with it, and I am hoping that people will decode their meanings to be able to give me back information about what they thought of it. I will complete a user test on my design once I have completed it and see if any of my intended messages are met. Alasuutari, P. 1999. Rethinking the Media Audience: The New Agenda [online]. Sage, London. Available from: https://books.google.co.uk/books?hl=en&lr=&id=VY3zaa9d8OMC&oi=fnd&pg=PR7&dq=audience+reception+theory&ots=PU3yUMcoGZ&sig=vmLkozouKZb-CjWz1l5XJqgXTGA#v=onepage&q=audience%20reception%20theory&f=false [23rd January 2015]. Louw, E. 2001. The Media and Cultural Production [online]. Sage, London. Available from http://www.sagepub.com/upm-data/2775_Mc10post.pdf [24th January 2015]. After researching into the Arduino’s capabilities, it is not going to be possible to have an electro magnetic current running through as there is not enough power in the Arduino and it could cause a lot of damage if completed wrong. So my revised idea is to have a motor with magnets on the end of rods, and a Ping sensor that determines how close or far away someone is which will change the speed in which the motor rotates. I feel that although this is still going to be challenging for me as I am new to Arduino, it is going to be one of the simplest approaches I could do with the outcome being very effective. The audience will have to engage with it in order for it to do anything, and I feel the use of ferrofluid will be very new to most people. For what I am hoping to achieve, I am going to need to use an Arduino board to create the installation I am wishing to make. Arduino is an open source electronics platform with simple hardware and software. The Arduino board I can have access to at University is the Arduino Uno board which looks like this: The Arduino Uno board allows you to upload sketches onto the board, and “receives input from many sensors and affects its surroundings by controlling lights, motors and other actuators”. 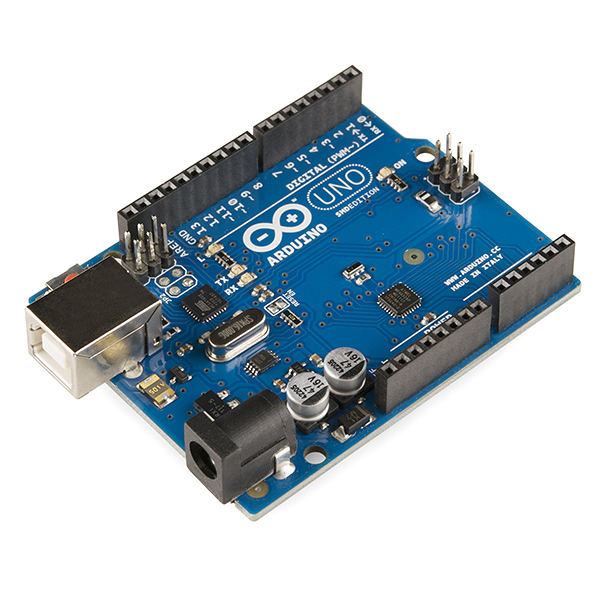 The Arduino software uses a code similar to that of Processing, telling the Arduino what to do by programming the code and uploading it onto the board. This is going to be the best thing for me to use as I am wanting to make a free-standing installation using ferrofluid and magnets. I have been looking into the kinds of things I can use with the Arduino to make it interactive, and I think a PING sensor would best suit my idea. 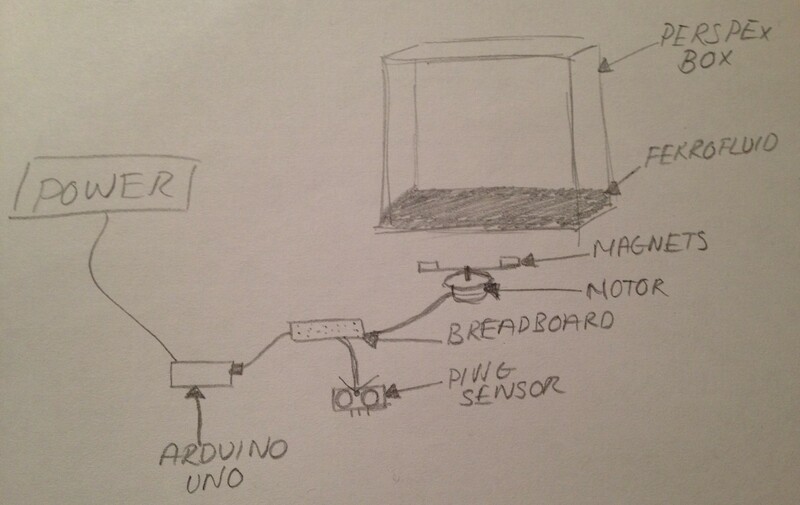 Use a PING sensor on the Arduino Uno to determine how close or far away someone is. Rig up an electro-magnetic current through the magnet and other screw-like objects to create ferrofluid sculptures. The sensor would determine the strength of the current running through the magnet, so if no one is near nothing will happen, but if someone wishes to engage with it then the current will kick in and the sculpture will be formed. 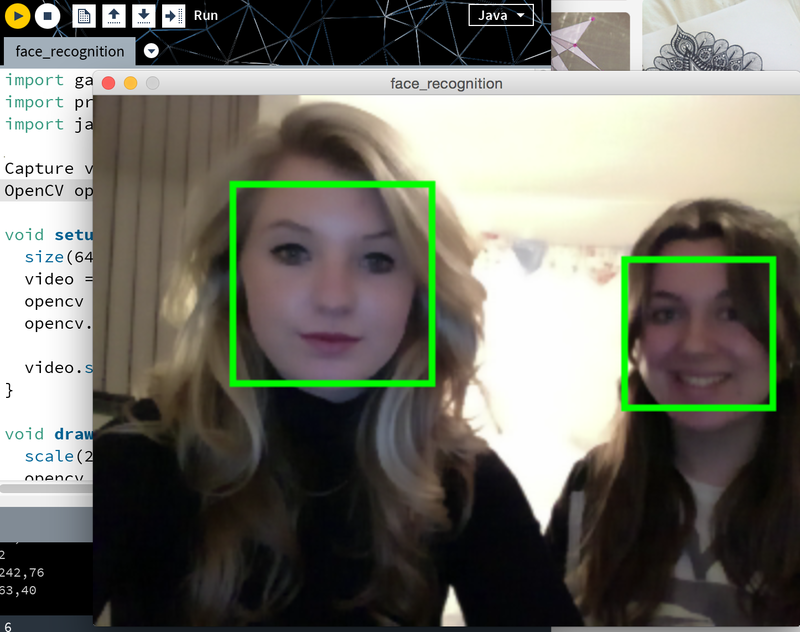 After researching for my idea of having a bouncing face from the camera capture, I realised I needed to use a face detection/recognition example, and these are not available in the examples given, but they are in the Open Library on the Processing website and on the software in the Library manager section. 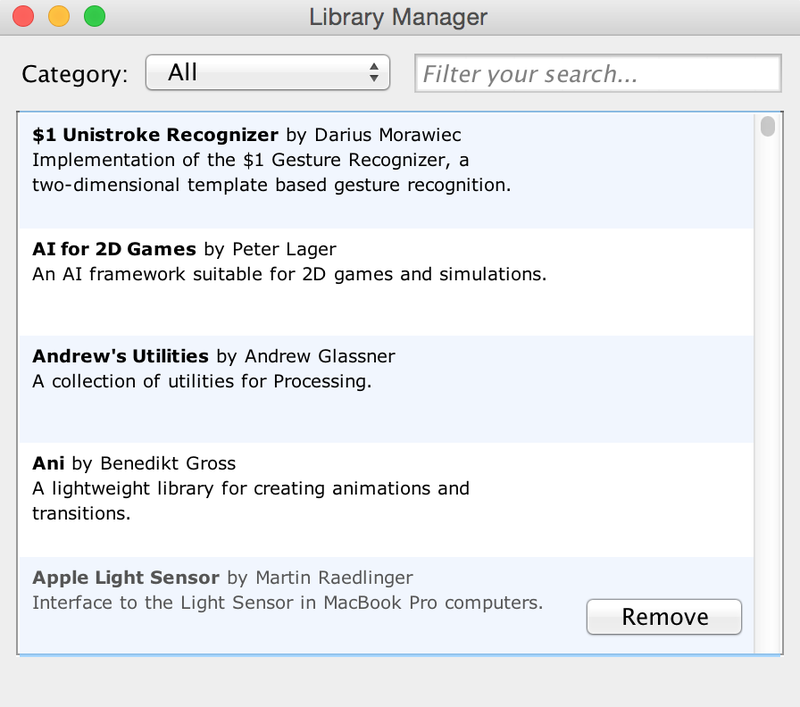 They can be installed and used by everyone as they are Open Source. 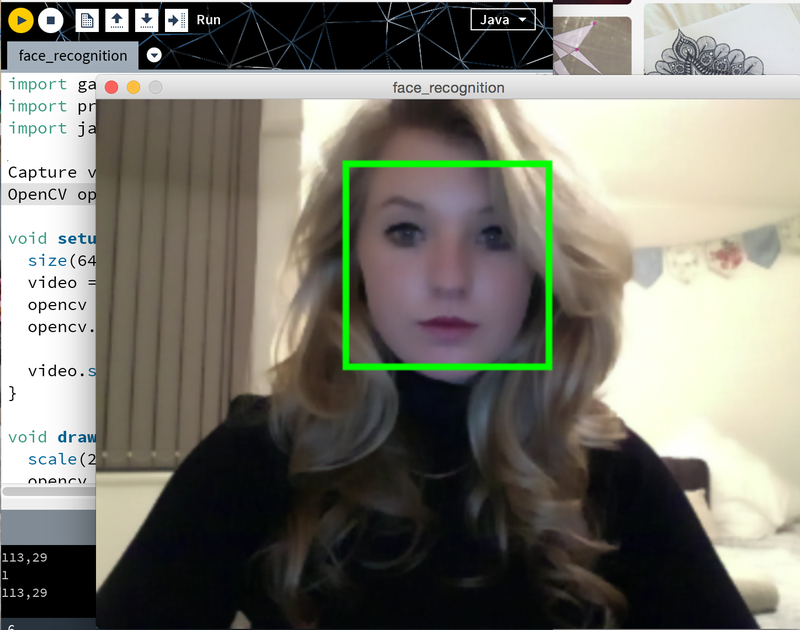 For my next step I am going to have to separately get the face recognition to work, and capture an image from from the face recognition, and once that is working I will be able to merge the codes from the Open CV and the Bouncing ball to hopefully get a working outcome. 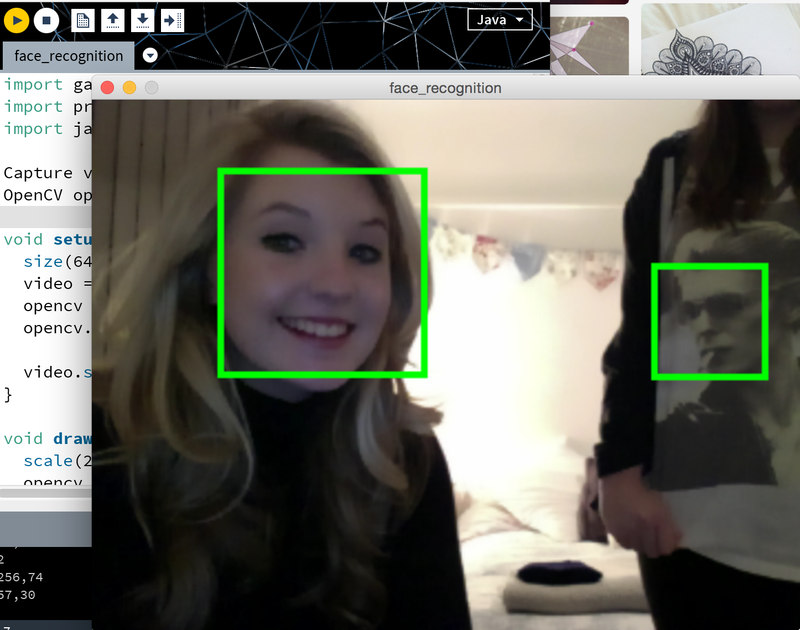 …It even detects David Bowie’s face! This is helpful for if I want to advance my idea to become more than one bouncing ball with more than one face on it. So my next step is to make the sure my bouncing ball sketch is working and then I will be able to combine and merge the elements of the two codes to create the bouncing face. For many years I have researched and been interested in installations and the interactivity used with them. I am researching them as I am wanting to use an installation rather than something just on a screen, such as my idea to use ferrofluid in a container, and using a sensor to control the interaction, it will adjust the position of the magnet. Todd Winkler (2000) explored the idea that “participants may become part of the work itself, as others outside of the sensing area view the spectacle of their interaction while seeing the results”, this is what I am hoping to achieve, that people will interact with my design and others will stand and watch, but want to engage too when they can. These are from the the exhibition archives on the Processing website. I find the plastic bags example very interesting as it takes the simple idea of camera interaction with pixels and creates it into a fully immersive installation using simple tools like plastic bags. The process and making of it would not have been simple, through having to use coding, mapping the pixels, creating an air supply to inflate and deflate the bags and also the linking to the camera or sensor, but the outcome is very simple yet effective for both the audiences watching and participating as it puts the audience into the piece, making them a part of the art. The fluid example is also very interesting as it is as simple as just touching the surface that will create a reaction. As they explain in the summary of the video, it also creates a collaboration and teamwork when people come together to see what can be created from numerous different people interacting with it. I also find the scientific reaction very interesting as it is very similar to the effect of ferrofluid which I am hoping to use for my final outcome. “Interactive media itself is part of the exhibition ‘content’ that visitors should experience and engage with; interaction with an installation is part of its ‘message’” (Hornecker and Stifter, 2006). The main idea I am getting from researching installations, is that there is numerous levels of interactivity which require different levels of audience participation to be able to create the message from the installation. Such as some designs just need the audience to walk past to interact, whereas some require the audience to fully immerse themselves within the installation using many different senses. For my project I want the user to do more than just walk past to be part of the design, so this is why I have decided to form an installation rather than simply graphics on a screen. Both of these and many others interactive designs are made using Arduino and Processing combined. So I am going to research about Arduino boards and the possibilities of what I could make with it. Hornecker, E. and Stifter, M. 2006. Learning from Interactive Museum Installations About Interaction Design for Public Settings [online]. OzCHI, NZ. Available from: http://www.ehornecker.de/Papers/OzCHI06TMW.pdf [15th December 2014]. Winkler, T. 2000. Audience Participation and Response in Movement-Sensing Installations [online]. Brown University, USA. Available from: http://www.brown.edu/Departments/Music/sites/winkler/research/papers/audience_participation_2000.pdf [15th December 2014]. 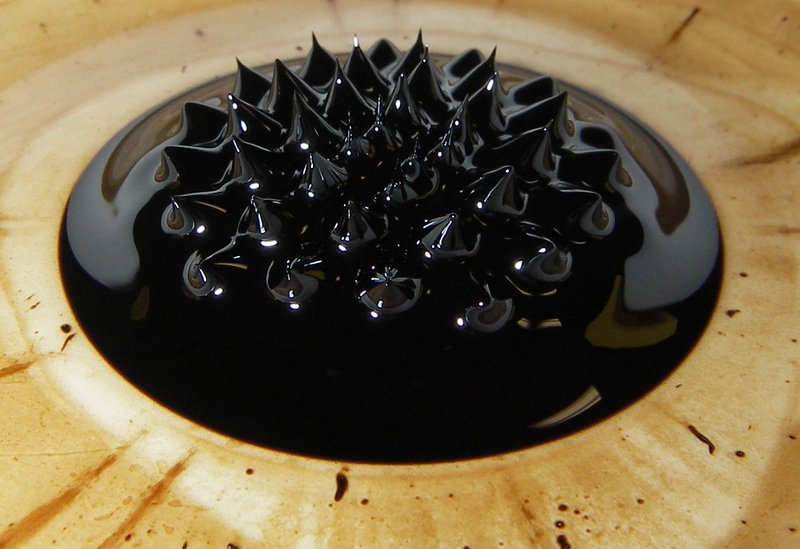 Ferrofluid is a magnetic liquid, that when it comes into contact with a magnet, it forms small spikes, as shown in the image below. I have been studying and putting to use ferrofluid for a while and I am always intrigued by it and the forms it creates. So this is why I would like to be able to use it in my final outcome, and incorporate an interactive form into it to entice audiences to engage and learn about it. There are a few downsides to using ferrofluid; as you can see from the image above, it stains surfaces very easily, leaving a horrible brown colour behind. Another downside is that the ferrofluid must not come into direct contact with the magnet, otherwise you would not be able to separate them after. However these can be solved if great care is taken, and I think it could create a very interesting installation. 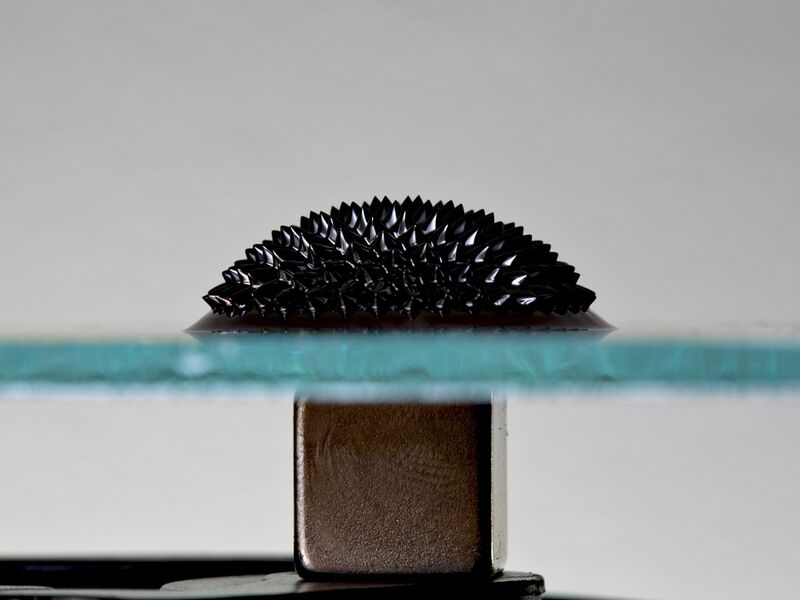 This is what it looks like when ferrofluid is put onto other metal objects with the magnet next to them, and also what ferrofluid is like when it is in water. An electro-magnetic current can also be passed through magnets, so the level of current going through the magnet can be changed by altering the electricity going to it. This could be a very interesting idea what I would like to explore further before I come to my final decision on my outcome. In Processing we learnt how to code a basic camera interaction design, which when the background of the capture screen is dim, the screen would be black, and when the background changed to bright, the colour on screen would then turn to white. 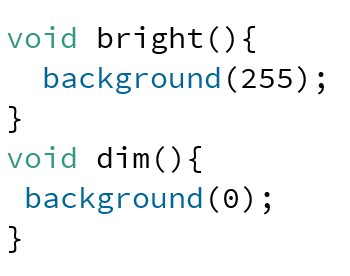 We were also set the task to change it so that the opposite happened, the video is of it in action and I selected to show the code below as this is the part that determines the shade. This is a good way to start leaning about camera interaction as it is not too complicated but many ideas can be built from it. Although it only requires a low level of interaction from the user and gives very little back, the idea it gives can stem many other simple ideas from it that may require a higher level of interaction, such as when a user walks across or into the camera, there could be bars of colour that change according to what they are wearing and where they are on screen. I have made a brainstorm map of all the various ideas I have had for my final project so far. Some using camera interaction, some using microphones and some installations using sensors as the interaction source. One of my favourite ideas so far is the use of ferrofluid in an interactive installation, using a sensor to detect where someone is, it would change the position of the magnets under the ferrofluid. I prefer the idea of installations because as well as it being a bit different, I think it would get more attention therefore more feedback. Ferrofluid is a very interesting substance so I think people would learn something if they interacted with it as well as it just being a bit of fun.